It's been awhile since the world has seen so many landline phones in action! Dozens upon dozens of celebrities teamed up for the Hand in Hand telethon on Tuesday night, ultimately raking in a whopping $44 million for Hurricane Harvey and Irma relief. The list is truly endless, so here's just a general roundup: Tom Hanks, George Clooney, Leonardo DiCaprio, Oprah, Reese Witherspoon, Justin Bieber, Sofia Vergara, Stephen Colbert, Jimmy Fallon, Robert DeNiro, Al Pacino, Julianne Hough -- actually, on second thought, just scroll through the gallery below. Within minutes of the hour-long special's start, phone lines were already jammed. (We tried to call -- repeatedly -- around 8:15, to no avail.) 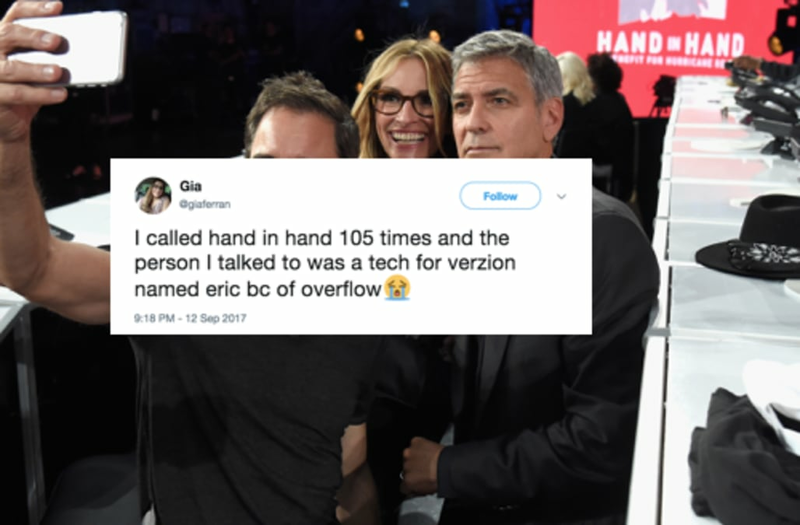 The huge response was awesome for fundraising, but not so great if you desperately wanted to chat with a celeb: "I called hand in hand 105 times and the person I talked to was a tech for Verzion named Eric because of overflow," one caller tweeted with a crying emoji. Well, what can ya do. But before you get cynical, rest assured, the telethon wasn't just a big photo op: Those celebrities were answering the phones! Plenty of Twitter users confirmed that they'd spoken to major stars. "Talked to Oprah for my donation," one excitedly tweeted. In addition to individual donations, a number of companies stepped up to announce huge contributions during the broadcast. Apple donated $5 million, while the NBA Players Association dropped $500,000 and will also match any pro basketball player's donation up to $20,000. The massive fundraiser will aid hurricane victims primarily in Texas and Florida, where consecutive hurricanes ravaged entire cities. More than 60 people in the Houston area died due to Harvey, and 12 US deaths have been reported in relation to Irma. Hurricane Irma (L) and Hurricane Jose are pictured in the Atlantic Ocean in this September 7, 2017 NOAA satellite handout photo. NOAA/Handout via REUTERS ATTENTION EDITORS - THIS IMAGE WAS PROVIDED BY A THIRD PARTY.